A routine stop at the local bagel shop became an unforgettable one for many customers Thursday morning in Hackensack, thanks to "Banjo Greg." 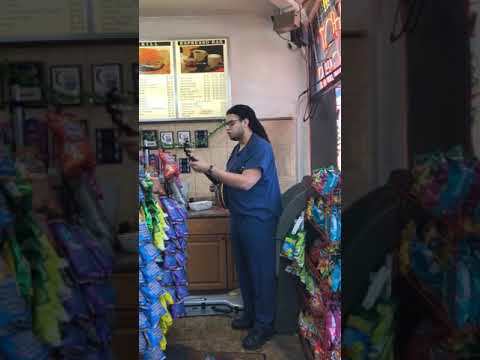 Dressed in his navy blue scrubs, 21-year-old Greg Donlan put on a live bluegrass show at The Bagel Shoppe on Passaic Street, after weeks of requests from employees. Finally, to their delight, it happened. "I've been coming here a while and as I started coming more and more I got acquainted with all the guys working here," said Donlan, who works at the Rochelle Park CVS. Donlan, who is self-taught on the banjo, performed in the shop as customers danced and filmed. Anyone who went to Hackensack High School between 2015 and 2019 would know him as "Banjo Greg," he said. "I stop here for coffee before seven-hour trips to gigs," Donlan said. "But today I'm just going to work."